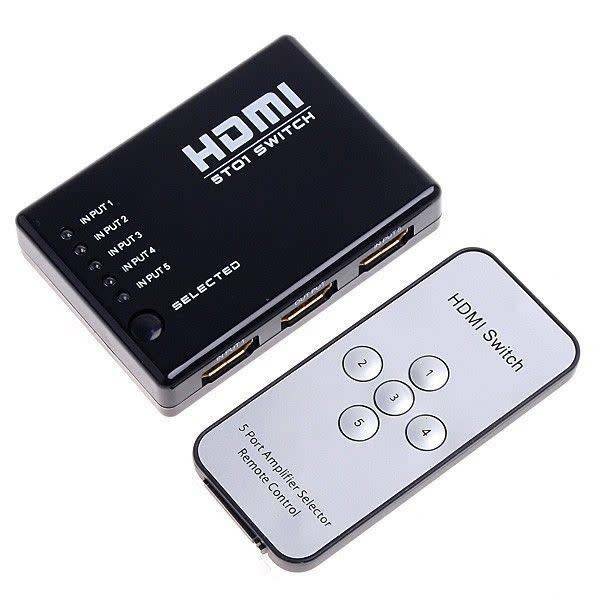 5 Port High Speed HDMI v1.3 Mini Switch 5x1 for PS3 XBOX 360 HDTV STB, Intelligent Auto Switch with Remote Control, Full 1080P, Non Powered - NWCA Inc. The 5x1 HDMI mini switcher routes high definition video (in multiple resolutions up to 1080p) and digital audio from any one of the five sources to display unit. Five inputs accommodate the simultaneous connection of up to five high definition video sources, such as satellite systems and HD DVD players. The output sends the high definition audio/video signals to a high definition display. Aside from the manual switching, the switching can also done via the IR remote that is provided with the unit for added convenience. The compact design eliminates the bulk of an HDMI switcher while still having the same functionality. Intelligent auto switch. When one source device is turned on or plugged in, the switch will automatically select this source.